A combination of digital technology, the World Wide Web, and Personal Computer has given rise to a new type of Maker Movement that is rapidly growing in popularity. Public organizations around the country have embraced the chance to create and make, with libraries, schools, and museums identifying rooms that they can transform into a Maker Space. Until now I haven’t had the opportunity to engage in this type of space, but since gaining access to the 3D Printer I’ve been able to engage in the hype and I can say that I’m hooked. 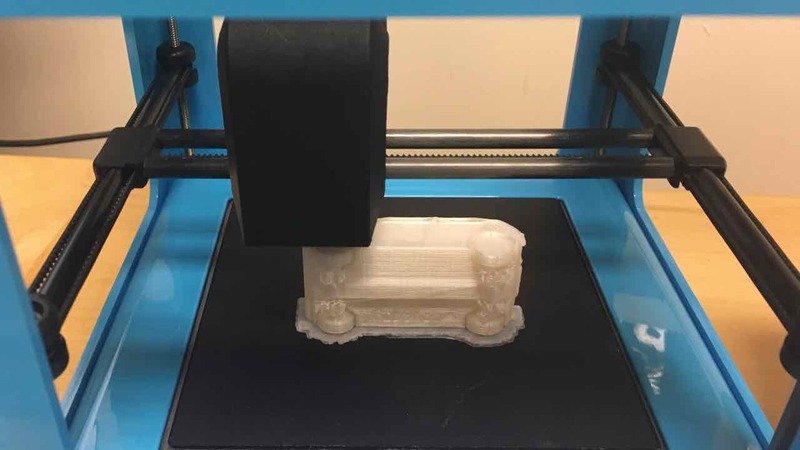 Having problem-solving my way through some of the technical challenges and learning curves that exist with 3D Printing, I’ve now been able to explore an idea I had last year – 3D Printing gifts for the children’s Christmas Stocking. 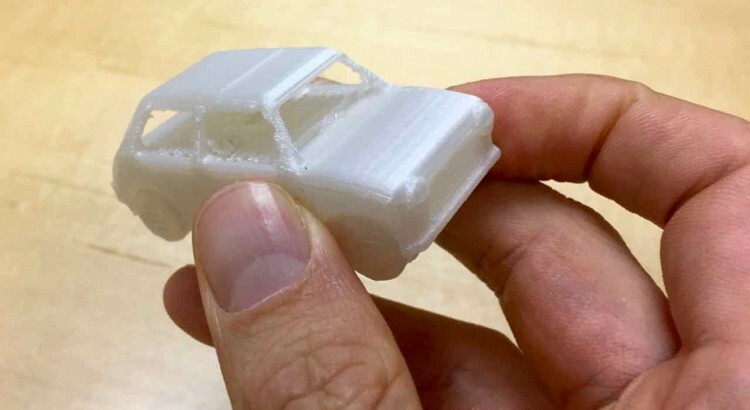 While making an object that can be printed requires some patience and technical knowledge, there are ways for parents to explore this idea without getting into the weeds. For a start there might be public access to some type of Maker Space in your area that offers 3D Printing workshops. If this isn’t an option you could explore some of the online 3D Printing services. Shapeways appears to be one of the more popular options, but it looks like Staples have jumped on the bandwagon and also now offer some type of service. The car was a free download to test out the printer. The cubes was my first attempt to create something I had made from scratch. The bottom is hollow so they can fit inside each other. Now, there’s a couple of options for 3D Printing gifts for the Christmas stocking. The first is to visit one of the many online libraries where you can download 3D printable object (Thingiverse is my favorite and they’ve already got a number of Christmas tree ornament options available). The other option is to create the model yourself, which I think is more in line with the whole making and creating concept – so in case you’re interested in this idea, which is kind of the main gist of this article, I’ve offered some suggestions below. I think you’ll need some comfort with digital technology, but you’ll be happy to hear that you don’t necessarily need to make a drastic purchase as the software is free and you can outsource the printing to one of many online 3D Printing companies. LEARN HOW TO 3D MODEL – To model you need a 3D modeling program. Blender is a FREE 3D Modeling and Animation software. In my opinion it’s one of the best open source applications on the planet (open source means that the software is available for anyone to use, modify, and share for FREE). Blender comes with a steep learning curve, but comes with a fantastic online community that has created a variety of forums, websites, and video tutorials to support beginners. If you don’t fancy Blender there’s a few other options such as Google SketchUp. Whatever you choose they’ll be some type of challenge to overcome, but it’s so worth it once you see your creation begin to print. 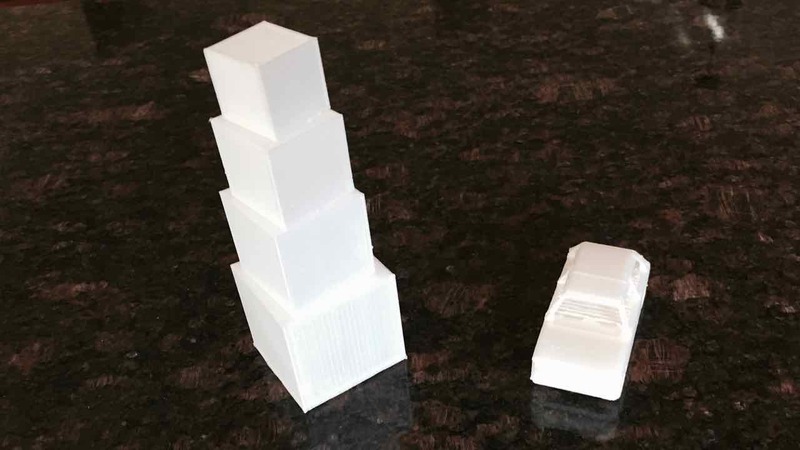 KEEP IT SIMPLE – As I’ve said there is a few learning curves to 3D Printing, so even if you’re super good at modeling in a 3D environment, my suggestion is to start by keeping the models simple and not too complex. My first 3D Printed gift for the boys was a collection of different size cube objects that can stack up or fit inside one another. Nothing crazy! The more complex the model the more likely it is to have problems in printing. SEND OFF TO PRINT – Like Vista Printer, who I used to print our Holiday Cards, companies like Shapeways offer 3D printing service, so you don’t even need to purchase a printer. The only thing to consider is that many of these companies charge by ‘volume’ of your shape so you need to spend a little more time learning how to size your objects and make sure they’re not bigger than they actually need to be. BUY A 3D PRINTER – Yes, 3D Printers are no longer super expensive, though they’re still not as cheep as your standard HP Printer. M3D is the model I’ve begun to explore and I absolutely love it (though it’s software is currently a little buggy with Macs). M3D was funded through a KickStarter campaign and only costs $350. What I like most about this printer is the SMALL build area, which for most people is a negative, but I like it because it means I can’t be tempted to build something really big and spend lots and lots of money on filament (the 3D Printer equivalent of Ink). In regard to this article it’s the perfect size to print small stocking fillers such as toy cars, planes, trains, etc. Also it doesn’t run on propriety software so you have the ability to model in the application you’re most comfortable using so long as it exports as an STL file (the most common 3D Print friendly file). My research led me to the M3D Printer. Negative – buggy with Mac, and some tecky knowledge needed (though perhaps less than others). Positive – Affordable, Quick Prints, and cheap filament (equivalent to Ink), and ability to use any software that exports to STL file. In June I was at the New Media Consortium Summer Conference, meeting great educators from around the world. 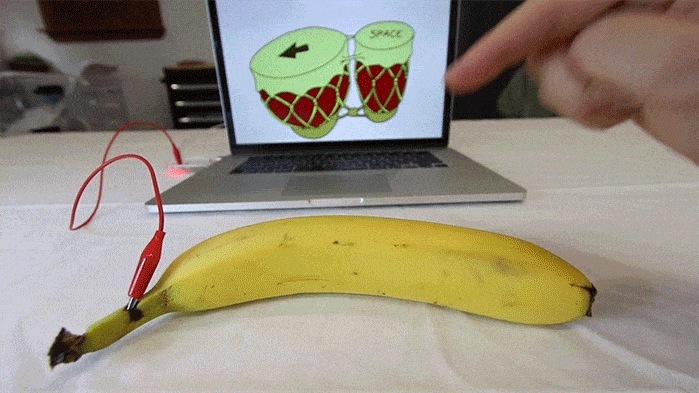 During the Idea Lab (my favorite event of the conference), I stumbled across a strange table that had a banana (or at least I think it was a banana), attached to a wire that plugged into a computer. Yes – I knew what it was – the Makey Makey Kit, which is one of the more popular Electronic Invention Kits, which are proving to be a great way to introducing young children to computer science, by connecting everyday objects to simple programs. Jeremy Sarachan, who among other things has studied the use of ‘cool’ tech in education, shared his experience using these types of kits with middle school students, and I asked him to offer some advice to parents who might want to explore this device with their children outside the classroom. What do you consider the value of introducing electronic or computer science starter kits (like Makey Makey) to young children? 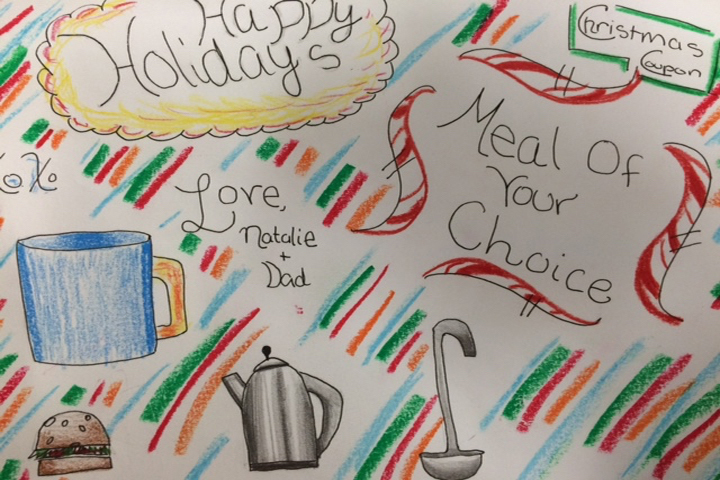 For some kids, their highest level of creativity emerges in using these tools. Digital technologies often require kids to incorporate other skills—drawing, crafts, and writing—and so they find connections between various techniques. Technological tools [like Makey Makey] also appeals to kids by bringing together both artistic and STEM (Science, Technology, Engineering and Math) skills and hopefully, will encourage adults to stop placing these skills/experiences at two ends of a spectrum, instead allowing kids to see how the various topics they are studying (including content from other disciplines) can be brought together. It also allows them to communicate their ideas and feelings in new ways, and gives them an outlet for expression. Many parents might find electronics or computer science type activities intimidating, what advice can you offer to those with little knowledge in this area, but who want to introduce their children to these subjects? 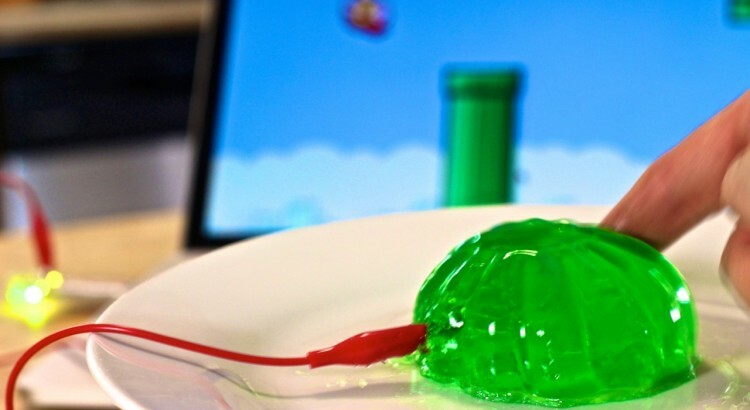 One, some kits are really quite easy–like the Makey Makey, and this provides parents an opportunity to get over some of their fears of technology. Second, one needs to trust their kids and allow them to experiment, and more importantly, let them lead the way in exploring and finding new technologies. Parents will often know less than their kids, and that’s okay. I had tried to introduce my daughter to block programming with both Scratch and Mindstorms and it didn’t take hold (and I didn’t push it). She found Blocksworld, and entirely taught herself–one day, she just showed me the coding she had done–I hadn’t even known she was doing it. Three, if neither one or two works, multiple opportunities exist in many communities–perhaps at a local science museum or college–where your child can explore new technologies with other kids —and then let them teach you! What type of starter activities do you recommend to parents who have recently purchased an electronics starter kit like Makey Makey? Scratch is an old standard now. Its block programming format has been adapted in countless other software interfaces. For work on the screen, Blocksworld and Minecraft are great. Blocksworld allows for block programming; Minecraft for 3-D building, although there are now multiple books and online learning opportunities for kids to learn about coding mods (modifications to the Minecraft world–from adding new tools to changing the weather and beyond). App Inventor (and online Android app creation site) is another easy and free opportunity for preteens and beyond. For building in the real world, the Hummingbird Robotics Kit offers a more flexible and easier interface than the standard Arduino systems and (although I’ve yet to order a kit), Little Bits is an up-and-coming option. If you’re interested in technology check out another 3 Question Interview, with award winning educator Jonathan Nalder who shared 3 mobile apps for Creativity. 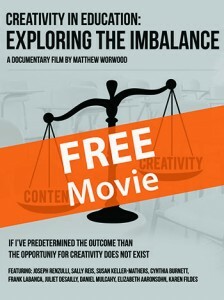 This Web site is a discussion on how we might nurture and cultivate creative thinking at home. 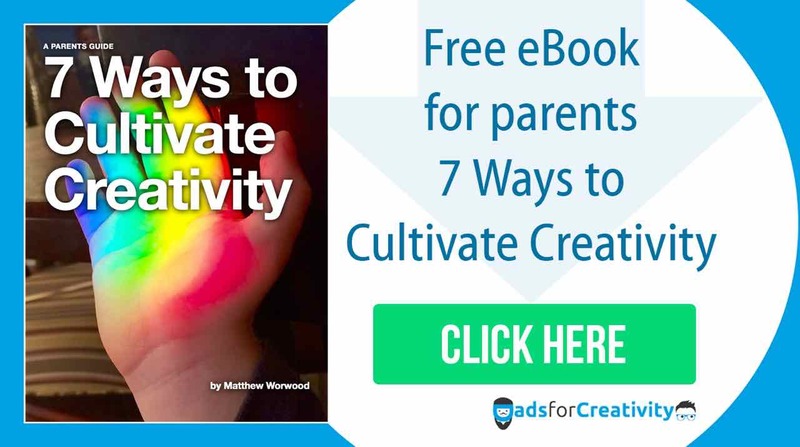 Naturally this discussion evolves around our children and ways we can engage the characteristics most often associated with creativity, such as the imagination, curiosity, a tolerance for ambiguity, originality, and the ability to produce and consider many alternatives. However, lets change things up a little and talk about how we as parents might better engage our own creativity? It’s probably most associated with problem-solving, coming up with new strategies to get your three-year old to sleep through the night, or how you might balance family life over a professional deadline. These are all great conversations, but I’m writing to promote one thing today – make a costume for Halloween! Over the last couple of years I’ve noticed that most Halloween costumes have been purchased, and not made. This time of year they’re on sale at the likes of Costco, Target, Wallmart, and even Pottery Barn. There’s great deals to be had online, and unique costumes to be bought at Web sites like Esty and eBay. It’s easier to buy, it’s harder to make! But buying is not as creative, and making. Last year my son wanted to be a plane, it was a great problem to have and challenged our creativity to the max. 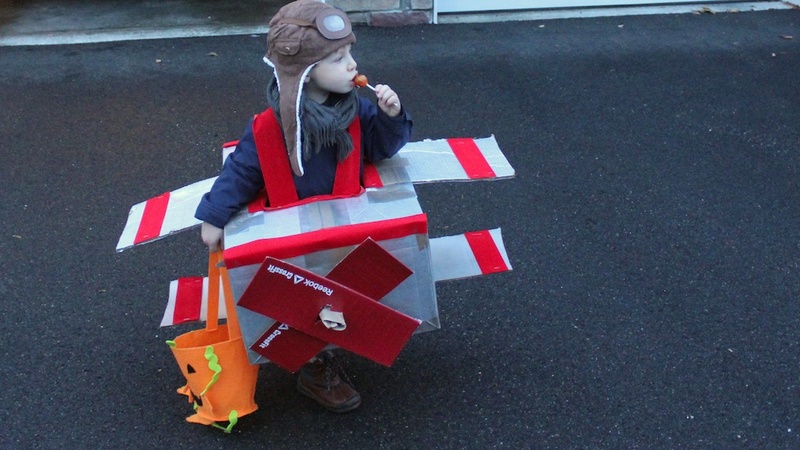 We had one weekend to come up with an idea on how we can turn our son into a flying machine. I confess my wife took the lead and searched out designs online, while I gathered boxes. The outcome can be seen in the picture above. The costume was a huge hit among our neighbors and I was most proud of my wife’s creative accomplishments. Time is a massive factor when it comes to making a costume and I recognize it just isn’t always possible, but even if you go down the purchased route, try to avoid the purchase of a complete costume and instead try and buy it pieces, or make accessories that take it to the next level. What’s more, the making of a costume is a great family activity to engage the imagination. It goes beyond artwork and into genuine problem-solving. For example, this year my boy wants to be a dragon skeleton that breaths fire. My wife is working on getting him to change his mind, but I already have a prototype of a head, and now need to problem-solve how we can get the head to breath fire. If it’s too late and you’ve purchased your costume, be sure to at least make note of the homemade costumes on display that night, and maybe snap and share a few pictures to use as inspiration for next year.